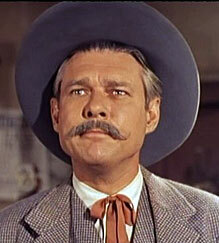 Handsome, mustached, deep-voiced Don Harvey was one of the post-WWII group of B-western and TV badmen who quickly rose to prominence in the late ‘40s and early ‘50s, especially on TV where he made well over 100 westerns. 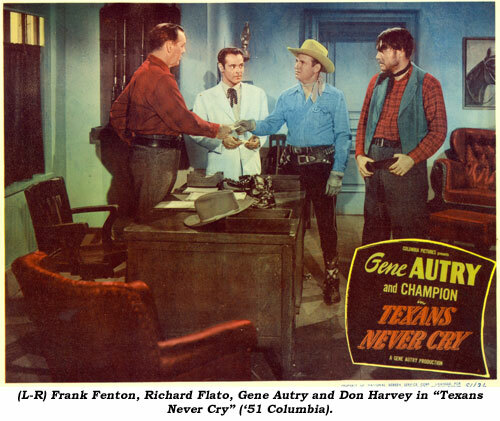 Sometimes dress heavy, sometimes one of the gang, he was a regular face on “Gene Autry”, “Wild Bill Hickok”, “Range Rider”, “Annie Oakley”, “Roy Rogers”, “Sky King” and others. 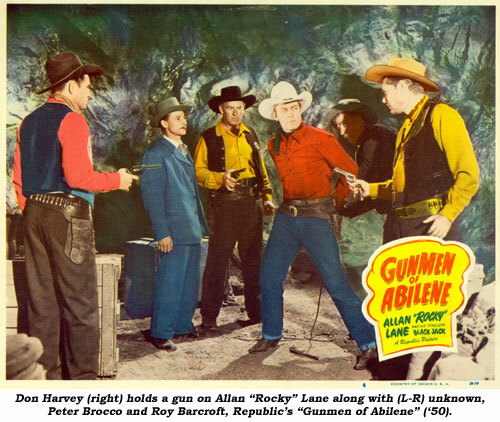 As TV issued in the adult western, Harvey began playing character roles on “Rawhide” (a semi-regular drover, Collins), “Restless Gun”, “Texan”, “Sugarfoot”, “Wyatt Earp”, “Tall Man”, “Laramie” and others. After making his first movie in ‘45 at Universal, “That Night with You” which starred Franchot Tone, Don quickly became a regular in producer Sam Katzman’s band of serial performers. 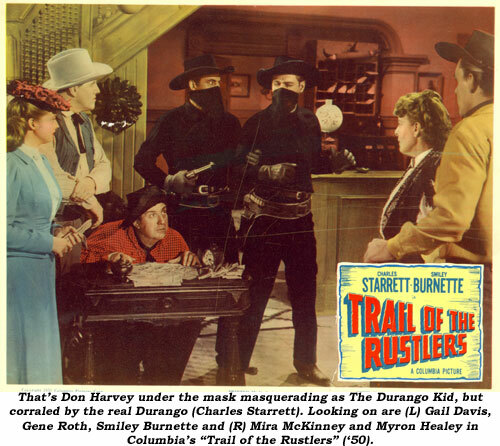 Don’s first for Sam was “Batman and Robin” (‘49) and he appeared in seven more up through “Blazing the Overland Trail” (‘56 Columbia), having the dubious distinction of being the last lead heavy in the last serial made. Don Carlos Harvey was born December 12, 1911, in Marquette, Kansas, and was raised by his parents John and Frances Harvey in the historic Kansas township of Council Grove, the last supply stop on the Old Santa Fe Trail before heading west. Don’s father (from California) was a railroader for the Missouri Pacific, his mother (born in Nebraska) worked as a laundress at home. The old Last Chance store on West Main Street was later converted into a residence, and this is where his divorced mother raised Don, who was known as Carlos in his younger days. Don began acting in high school plays and also served as assistant editor of the school year book. In 1928 he was a member of the football team. After graduation in 1929, Don attended Salt College Business College in Hutchinson, KS, where he graduated in ‘32. Don returned to Council Grove where he was invited to be Master of Ceremonies at the weekly amateur night at the Stella Theater. At this time there was a traveling theater troupe called the Model Players. They had a circuit, playing five nights a week, each night in a different town, with the Friday night performance being at the Stella Theater in Council Grove. The owner of this stock company, Harry Clark, spotted Don at one of the amateur nights, was impressed with his ability, and invited him to join the troupe. Don worked several years in radio, then they went to Hollywood in ‘44. Praiseworthy comments about Don come from several of his co-stars: Gregg Barton: “Don was a serious thespian—He walked proud.” House Peters Jr.: “He was such an easy going chap and a much finer actor than given credit for. He also gave of his time to entertain at the Actor’s home. He was one of the most giving people in the business.” Terry Frost: “I worked with both Don and Jean. They were confident actors and nice people.” Pierce Lyden knew Don well. “Don was a good actor, a good friend. He was serious, had his dialogue memorized and was always ready to work. I think I first heard the expression from Don—‘never let ‘em see ya sweat.’ When he went on an interview for a picture, he walked into the casting office like he already had the job. He was the kind of guy that when they asked him what he had done he’d say, ‘I must be in the wrong place, I thought you wanted to know what I can do.’ He was always smiling and enthusiastic about everything. 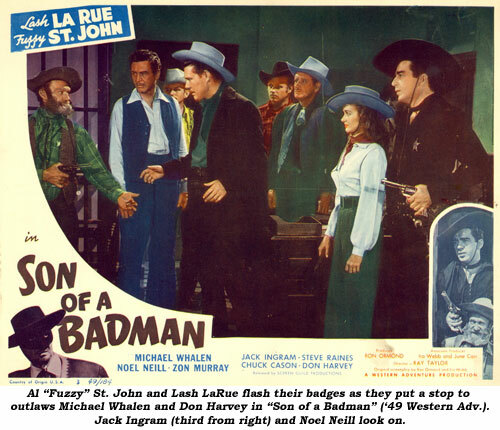 He was one of the ‘spark plugs’ of the Hollywood Christian Group, on the Steering Committee and an officer. Harvey could play convincing good guys as well as baddies, probably because of his experience on the stage and as a radio announcer. If he had landed in Hollywood at an earlier time, I’m sure he could have promoted himself into something big. His wife, Jean, a character lady in pictures, was a princess. They didn’t have any children. They were a very happy, loving couple.” So well liked was Don, he was named honorary mayor of Pacoima. 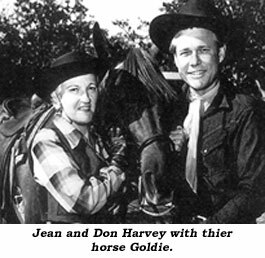 Incidentally, Don and Jean were the owners of the movie horse Goldie, ridden by Bill Williams on his “Kit Carson” TV series. Don had completed an episode of “McHale’s Navy” and was a policeman in Stanley Kramer’s madcap, “It’s a Mad, Mad, Mad, Mad World” when he died suddenly of a heart attack at his Studio City home on April 24, 1963.